How to Throw the Ultimate Galantine’s Party! Have you heard of GAL-antines? It’s a party inspired by the show Parks & Rec where Leslie Knope throws a Galantine’s party for her lady friends — waffles and friendship. It’s ladies celebrating ladies. SO fun!! Tauni from Snap and I combined to throw this party and we had such a fun time getting together with OUR lady friends. We loved it so much that we decided that we will have an ANNUAL Galantine’s party each year. The real date of Galantines is the date before Valentine’s Day — so you still have time to celebrate with YOUR lady friends. Here are FIVE ways to throw the ultimate Galantines Party!! AND — be sure to enter at the bottom of the post. We are giving away a $200 VISA giftcard so YOU can throw YOUR own Valentine’s or Galanetine’s Bash. YAY! 1. Decorate for your Galantine’s Party. I created a whimsical Waffle Cone Flower Centerpiece. It seriously takes five minutes to put together with flowers from the grocery store and drinking glasses. All you really need to do is grab a box of waffle cones. 2. Make a pretty tablecloth. I made my Sharpie Heart Tablecloth with a white tablecloth and then I added scallops and hearts. This project also took seriously five minutes to make. I will have a tutorial and more pictures of this idea on the blog tomorrow morning. Tauni made this Tauni from Snap made this Overnight Sausage and Egg Casserole. Yum! 3. Whip up some yummy food. Of course we had to have waffles for our Galantine’s Day party. I found the cutest pink waffle maker. And I LOVE it. It makes extra thick waffles that turn out perfectly every time. I lucked out because I really ordered it because it’s PINK, but it actually has ended up being my favorite and I use it all the time! I also have FREE printable Galantine’s Day printables as well as FREE Waffle Bar Printables. So grab those, print them off and you are all set!! 4. Make a Photo Booth for your ladies. Tauni made a glittery “Treat Yo’ Self” banner and she has the tutorial for that on her site. Add some props and balloons and your lady friends can document all the love and friendship through Instagram photos. 5. Send your ladies home with a little gift!! I found red and pink nail polish and I made a simple Galantine’s Day Gift Printable for YOU. Just print them off, cut them off and attach them to nail polish bottles with baker’s twine. Your ladies will love these little gifts!! Celebrate the season of loving with your gals at YOUR very own GALantine’s Party!! And here are TEN other awesome Valentine’s Day Ideas. Be sure to check them out!!! NOW – don’t forget to enter the $200 VISA giftcard giveaway!!! Easy & Simple Graduation Party Ideas! Great Ideas — 19 Halloween Party Ideas! Great Ideas — 23 DIY Party Ideas!! 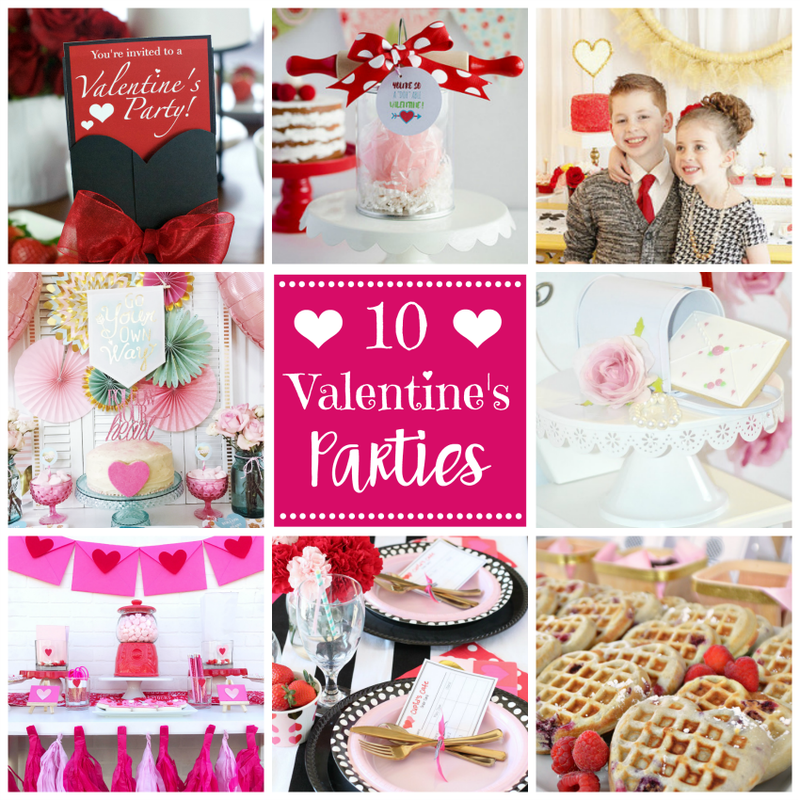 Great Ideas — 20 DIY Party Ideas! Great Ideas — 15 Super Bowl Ideas! Such a cute idea! Where do I get the printables for the waffle bar? Really gorgeous party! No doubt you all had a great time. Never heard of this Galantine idea before, but I love it. Such a beautiful party! Looks like you girls had a blast! How fun! Thanks for sharing all these amazing ideas! I love the heart shape waffles! Idea. I’ve never heard of this before!